The month of September got off to a rousing start, with a gigantic one night tournament at the Charlotte Coliseum in Charlotte, North Carolina on September 1st set to crown a new United States Heavyweight Champion. The U.S. Title had been vacated in mid August, when the United States Champion Ric Flair also became one half of the NWA World Tag Team Champions. Unable to hold both championships simultaneously, Flair opted to vacate the U.S. Title. A crowd of 5,352 enthusiastic fans saw an action packed tournament! In the first round matches, Ricky Steamboat pinned Ernie Ladd, with Ernie leaving the Mid-Atlantic area after this defeat. The big Chief Wahoo McDaniel made a special appearance back in territory, and battled “Big” John Studd to a double disqualification result, eliminating both men. Mid-Atlantic Heavyweight Champion Ken Patera pinned Rufus R. “Freight Train” Jones to advance. “Nature Boy” Buddy Rogers made a rare in-ring appearance, defeating Bob Marcus by submission via his figure four leglock. “Superfly” Jimmy Snuka defeated “Mr. Wrestling” Tim Woods via a referee’s decision to advance. The world renowned Bruiser Brody ventured into the Mid-Atlantic area and defeated the ageless Johnny Weaver. Rounding out the first round action, “Jumping” Jim Brunzell edged out Dewey Robertson on a referee’s decision in a largely scientific bout. The second round of the tournament saw Ricky Steamboat advance over Buddy Rogers via countout, and had Jim Brunzell defeating Bruiser Brody by pinfall in a surprise. Jimmy Snuka and Ken Patera received second round byes, and automatically advanced to the semifinal round. The semifinal round of the tournament saw two highly competitive and entertaining bouts. The first matchup was a battle of champions, as NWA Television titleholder Ricky Steamboat battled Mid-Atlantic Heavyweight Champion Ken Patera. Ricky was very effective in using his speed advantage over Patera, and was able to catch Ken off balance and capture a surprise pinfall to advance to the finals. In the second semifinal bout, Jimmy Snuka took on the “High-Flyer,” Jim Brunzell. While both men dazzled the crowd with their speed and stamina, ultimately the “Superfly’s” superior strength wore down Brunzell, allowing Snuka to advance to the finals with a hard fought victory. The championship bout between Ricky Steamboat and Jimmy Snuka to decide who would hold the United States Title was a lengthy one with many ebbs and flows. Both wrestlers showed their amazing stamina and endurance to put on such a terrific championship match, after battling their way through the grueling tournament. Snuka’s manager Buddy Rogers was at ringside, and while most fans believed he would interfere to assist his man in winning the U.S. belt, Rogers minded his manners and did not get physically involved in the action. After an extremely rugged exchange, Snuka was able to catch Ricky in a small package hold, secure the three count and walk out of the Charlotte Coliseum as the new United States Heavyweight Champion! 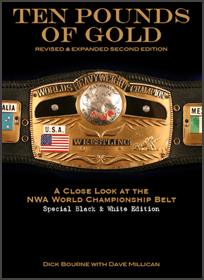 On the Mid-Atlantic Championship Wrestling television program that was taped from the WRAL TV studios in Raleigh, North Carolina on September 5th, Jimmy Snuka was announced as the new U.S. Champion, with his manager Buddy Rogers making it clear to announcers Bob Caudle and David Crockett that he did not interfere on Snuka’s behalf at anytime during the 45 minute finals bout with Ricky Steamboat. Rogers also strongly suggested that former United States Champions Ric Flair, Ricky Steamboat and Blackjack Mulligan didn’t have the credentials to challenge the “Superfly” for his new belt. Buddy Rogers also announced on this show that he had added a new wrestler to his stable, and it was none other than the strongman Ken Patera! Rogers said Patera was like an uncut diamond, that he would mold into his image. The September 5th Mid-Atlantic Wrestling TV show also featured two truly unique matches. The first match on the show was a Woman’s World Tag Team Championship match with the champions Joyce Grable and Vicki Williams successfully defending their belts against challengers Leilani Kai and Judy Martin. In another rarity, this show also had a match with the American Wrestling Association (AWA) Heavyweight Champion Nick Bockwinkel defeating Coco Samoa. The World Wide Wrestling television show that was taped on September 5th was also noteworthy. “Mr. Wrestling” Tim Woods had previously challenged Jimmy Snuka upon Tim’s return to the area, and the match occurred on this TV program, with Snuka now having the U.S. Title. Mr. Wrestling said he welcomed wrestling the “Superfly” as a champion, because he’d rather wrestle a champion than somebody who was just trying to become one. The match between Snuka and Mr. Wrestling was a back and forth encounter, with Snuka gradually gaining control with the help of his manager, Buddy Rogers. It appeared Snuka could have pinned Mr. Wrestling and won the match, but as announcer Rich Landrum said, the Superfly “took advantage” of his fallen opponent and put him in his new hold, the vicious “Guillotine.” This hold, and the length of time it was applied, seriously injured Mr. Wrestling’s neck. Even after the match was over, Snuka and Rogers attacked a prone Mr. Wrestling causing Ric Flair and Ricky Steamboat to run in and aid their fallen comrade. It took some time for medical personnel to stretcher Mr. Wrestling out of the ring, causing a delay in the scheduled matchup between Nick Bockwinkel and Abe Jacobs. Rich Landrum advised the fans that he would provide updates to the fans on Mr. Wrestling’s condition if any became available during the telecast, but none were forthcoming. A second gigantic one night tournament with strong Mid-Atlantic connections also took place early during the month of September. 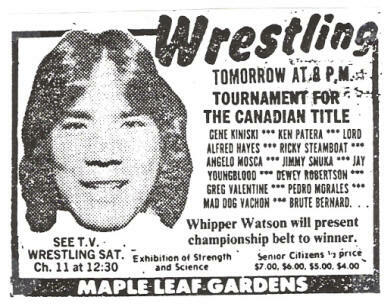 On September 9, 1979 at the Maple Leaf Gardens in Toronto, Canada, a tournament to crown a new Canadian Heavyweight Champion was held, and the event had a decidedly Mid-Atlantic flavor. The tournament was necessitated because Canadian Champion Dino Bravo had just left the area. Current Mid-Atlantic grapplers Ken Patera, Ricky Steamboat, Jimmy Snuka, Jay Youngblood, Dewey Robertson, Pedro Morales and Brute Bernard participated in this extravaganza. Both Jay Youngblood and Pedro Morales lost in first round matches, while “Superfly” Jimmy Snuka advanced in the first round as did Ricky Steamboat, who beat fellow Mid-Atlantic competitor Brute Bernard. 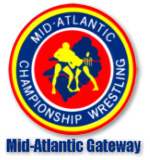 The most competitive match of the first round also involved Mid-Atlantic Championship Wrestling regulars. In a big upset, Dewey Robertson advanced to the second round over Mid-Atlantic Heavyweight Champion Ken Patera via a referee’s decision. The match of the tournament occurred in the second round, where Mid-Atlantic rivals Ricky Steamboat and Jimmy Snuka met in a rematch of their bout in the finals of the United States Heavyweight Title Tournament only a week prior! In a reversal of fortunes, Steamboat upended Snuka with a reverse cradle at the 15:37 mark to advance to the semi-final round, however Ricky pulled his groin while executing that maneuver, forcing him to forfeit his semifinal bout with Greg Valentine. Dewey Robertson continued his improbable run through this tournament, defeating former NWA Champion Gene Kiniski in 13:31. The final capped Dewey Robertson’s amazing string of tournament matches, as Dewey topped Greg Valentine in 10:32, by forcing Valentine to submit using Greg’s signature hold, the figure-four leglock! While becoming the Canadian Heavyweight Champion, Robertson continued to be a Mid-Atlantic Championship Wrestling regular. “The World’s Strongest Wrestler” Ken Patera had dominated the Mid-Atlantic Heavyweight Championship belt for nearly a year and a half, but all of that came to a crashing halt in September. 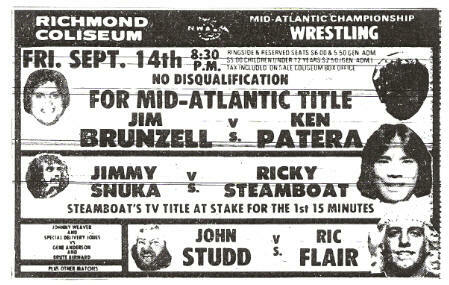 Specifically, on September 14th at the Richmond Coliseum in Richmond, Virginia, where a bloody but unbowed “Gentleman” Jim Brunzell overcame Patera’s swinging full nelson and shocked the wrestling world by besting Patera in a No Disqualification Title bout to become the new Mid-Atlantic Heavyweight Champion! Prior to the devastating defeat in Richmond, Patera had a run of successful title defenses, pining Brunzell in Columbia, South Carolina on September 2nd, thwarting the challenge of Blackjack Mulligan on September 7th in Forest City, North Carolina and even defeating Ricky Steamboat at the Scope Coliseum in Norfolk, Virginia the night before the Richmond Title loss. The new Mid-Atlantic Heavyweight Champion Jim Brunzell started off his Title reign with a rare scientific matchup with fellow “good guy,” the veteran Johnny Weaver. This Title bout between the fan favorites took place on September 23rd in Salem, Virginia, and was a crowd pleaser in every respect. “Jumping” Jim retained his newly won belt, but the “Dean of Wrestling” put on quite a wrestling display himself! Brunzell closed out the month with two rugged successful Title defenses, getting the better of former champ Ken Patera at the Dorton Arena in Raleigh, North Carolina on September 26th, and also prevailing against Patera the next night at the Norfolk Scope. The Mid-Atlantic Championship Wrestling TV show that was taped in Raleigh on September 19th started off with a bang with new Mid-Atlantic Heavyweight Champion Jim Brunzell being introduced to the fans with his new belt, and was followed immediately with AWA Champ Nick Bockwinkel talking up himself, and talking down his former AWA rival Brunzell. But the September 19th Mid-Atlantic Wrestling TV show then saw Baron von Raschke come out, and tell the viewing audience that the German Federation of Wrestling had sent him the “Manheim Medal” for him to present to his partner Paul Jones. This medal was for wrestling excellence, and was done in response to Paul’s pinning Ric Flair in the televised bout where Jones and Raschke recaptured the NWA World Tag Team Titles. In his words, Paul Jones was “touched” at receiving this new medal, but almost immediately Jones was interrupted by Jay Youngblood. Jay, on behalf of he and Ricky Steamboat, challenged Jones and Raschke for a World Tag Team Title bout! Jones talked back to Youngblood dismissively, calling him “Feathers.” However, Jones and Raschke accepted the challenge, but clearly felt that Steamboat and Youngblood were no credible threat to their World Titles. 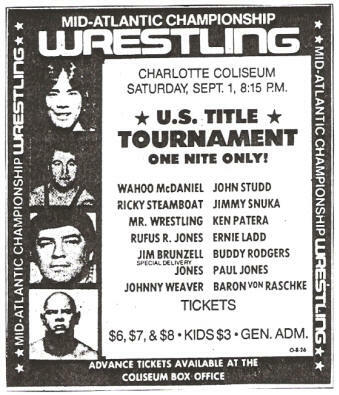 While the team of Steamboat and Youngblood was in its formative stages, the month of September saw Ric Flair and Blackjack Mulligan as the primary challengers to Jones and Raschke’s World Tag Team Championship. Three towns in the territory saw back-to-back bouts between these ferocious rivals during the course of the month. In Greensboro the two teams wrestled on September 2nd, with Jones and Raschke holding onto their belts by getting themselves purposely disqualified. That result led to a rematch on September 16th in Greensboro, with George Scott servicing as the special referee. Scott also disqualified Jones and Raschke, so the sneaky champions once again left Greensboro with their Titles. The border city of Savannah, Georgia also saw two championship bouts between Jones and Raschke versus Mulligan and Flair during the month of September. On September 9th the two teams battled to an indecisive result, and the return match in Savannah on September 23rd was no more decisive. But it was Columbia, South Carolina that saw the best championship matches between these two teams. On September 16th, Flair and Mulligan were oh-so-close to regaining their belts, but Jones and Raschke got themselves purposely disqualified to save their World Titles. A huge return Title match was set in Columbia on September 30th, but this bout was held within the confines of a seven foot steel fence! The Champions rose to the occasion, and defeated Flair and Mulligan. The Columbia match on September 30th, along with a stinging defeat by the Champions of Flair and Mulligan two days earlier in Richmond, seemed to suggest that Jones and Raschke were gaining the edge in this bitter feud. The end of the September 19th Mid-Atlantic Championship Wrestling television show was also noteworthy. It marked the return of Mr. Wrestling Tim Woods after his injury at the hands of Jimmy Snuka two weeks earlier. Mr. Wrestling was sporting a neck brace, and provided commentary over a video tape of the match where Snuka injured him. Before the show ended, Buddy Rogers and Jimmy Snuka rushed on the scene and attacked Woods again. Rogers took Mr. Wrestling’s neck brace off to further the attack. Then a deranged Rogers took off his shoe and gave it to the Superfly, who jumped off the top rope onto a prone Tim Woods who was on the concrete floor, driving the shoe into Mr. Wrestling’s exposed neck. The show went off the air with Mr. Wrestling lying in convulsions on the WRAL TV studio floor. In addition to the television appearances already mentioned, AWA Heavyweight Champion Nick Bockwinkel also had some exciting arena bouts during the month. In Columbia, South Carolina on September 2nd, Nick put his AWA Title up against Ricky Steamboat, and escaped with his belt via a DQ loss. Later that night at the Greensboro Coliseum, Nick again battled Steamboat, but this time with only Ricky’s NWA Television Title at stake, with Ricky earning the victory. Bockwinkel’s other appearance early in the month saw him defending his AWA Title against an old familiar face to Mid-Atlantic fans, Chief Wahoo McDaniel on September 3rd in the Greenville Memorial Auditorium. Once again, Nick lost the match by disqualification, but kept his Title. Later in the month, Bockwinkel visited the Greenville Memorial Auditorium again. This time Nick battled old AWA foe Jim Brunzell, this time getting a win by beating Jim with the AWA belt on the line on September 17th. Bockwinkel completed his Mid-Atlantic run the next night in Raleigh, battling Ricky Steamboat in a Title versus Title struggle. 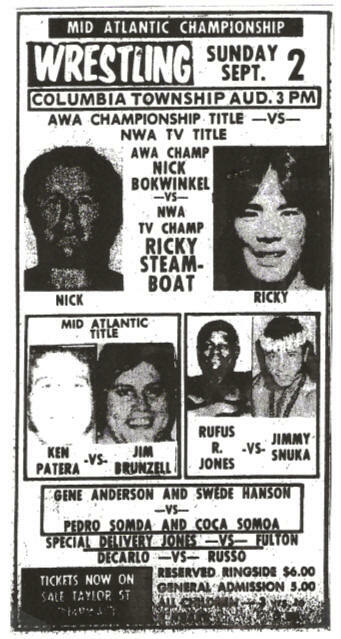 Speaking of Ricky Steamboat and his NWA Television Title, “Steamer” had several other significant bouts involving his TV belt that haven’t been already mentioned. The best of the bunch were Title versus Title matches against United States Heavyweight Champion Jimmy Snuka. In Richmond on September 14th, Ricky and the Superfly put on quite an aerial extravaganza, with Steamboat taking a DQ victory in the end. Two days later on September 16th, Steamboat and Snuka did a “double shot” Title versus Title battle, wrestling first in Asheville, North Carolina and then later at the Coliseum in Greensboro. The Asheville match was much like the one in Richmond, but the bout in Greensboro saw a more vicious match, with Snuka securing a pinfall via his dreaded “Superfly splash.” While Snuka won the Greensboro match, he didn’t carry the TV belt out because his victory occurred after the fifteen minute mark that the TV Title was at stake for. The month on television ended at the TV tapings in Raleigh on September 26th. These tapings were done “live” at the Dorton Arena, and included ten matches for those in attendance. The top events for this TV taping saw a United States Heavyweight Championship match between Jimmy Snuka and former champion Blackjack Mulligan, a Mid-Atlantic Heavyweight Title match pitting Jim Brunzell defending against Ken Patera that was mentioned earlier and a rugged contest between Ric Flair and his former ally John Studd. 1. Jimmy Snuka---The “Superfly” won the prestigious United States Heavyweight Championship on the first day of the month, and defended it with vigor throughout the month. With Buddy Rogers as his manager, Snuka was looking almost unbeatable in September. 2. Jim Brunzell---“Jumping” Jim Brunzell climbed to the top of the mountain in September, claiming the Mid-Atlantic Heavyweight Championship belt. And if early returns were any indication, it looked as if Brunzell could have a long reign. 3. Dewey Robertson---Even though he remained in the upper-mid card range in the Mid-Atlantic area, Robertson did capture the Canadian Heavyweight Championship belt in September, and went through quite a tournament to do it! 1. Mr. Wrestling---The white masked Tim Woods was injured early in the month by Jimmy Snuka and Buddy Rogers, and to make matters worse when he tried to return two weeks later, he was injured again by the same two culprits! 2. Ken Patera---The strongman from Portland, Oregon lost his prized Mid-Atlantic Heavyweight Championship belt during the month, and despite being added to Buddy Rogers’ stable of wrestlers, seemed to be slow to recover from his Title defeat by Jim Brunzell. 3. Rufus R. Jones---The ‘King of Wrestling” continued to hold onto his main event slot during the month, but his overall victories were dropping, as were his matches of real significance.